Explore the numerous day-trip ideas around New Delhi: Gurugram (Gurgaon) (SMAAASH, Ambience Mall, & more), Ghaziabad (Shipra Mall & Mahagun Metro Mall) and Worlds of Wonder - Amusement Park (in Noida). Plan for a day of cool, family-friendly fun on the 11th (Fri) at Splash The Water Park. 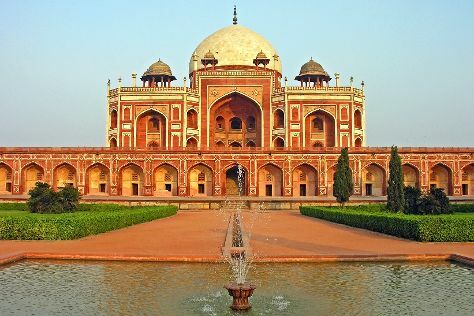 There's much more to do: admire the striking features of Humayun's Tomb, browse the eclectic array of goods at Chandni Chowk, take in panoramic vistas at Qutub Minar, and steep yourself in history at India Gate. To see more things to do, other places to visit, photos, and other tourist information, refer to the New Delhi travel planner. In July, daytime highs in New Delhi are 41°C, while nighttime lows are 31°C. Cap off your sightseeing on the 15th (Tue) early enough to travel back home.